Acid-free formula guards against fading and resists smudges and water to help ensure clear results. Count on professional-quality color documents for a great value, and get outstanding results every time. Original HP PageWide cartridges deliver the consistent printing performance, quality, and affordability businesses demand. 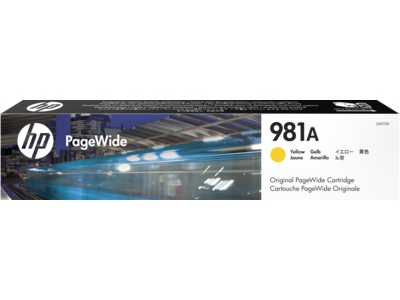 1 Yield based on ISO 24711 cartridge yields for HP 981Y Extra High Yield Original PageWide Cartridges. Comparison based on ISO 24711 cartridge yields for HP 981Y Extra High Yield Original PageWide Cartridges compared with HP 981 series Original PageWide Cartridges. Learn more at http://www.hp.com/go/learnaboutsupplies. 2 Comparison based on printing in Professional Mode.